Energy efficiency can be a difficult to achieve, but it is an especially difficult task for windows. Liberty Home Solutions energy efficient replacement windows have to let in plenty of light but still keep the cold out in the winter and the heat out in the summer. This is one reason there aren’t many windows on the market that can truly be called energy efficient. 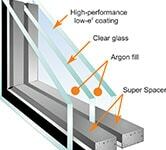 Soft-Lite, however, has figured out how to consistently create some of the most energy-efficient windows on the market. At the heart of this process is their highly-automated 200,000 square-foot facility. Their facility is so unique there are only three other ones like it in the world! Studies indicate that automated manufacturing reduces the failure rate in a finished product. By using their state-of-the-art facility, Soft-Lite is able to precisely engineer and construct windows to the strictest of standards. Add high quality materials into the equation and you end up with windows that are extremely well made, durable and energy efficient. All of the hard work and attention to detail pays off, because Soft-Lite has been recognized for their energy-efficiency windows by many respected organizations, including the Environmental Protection Agency. Soft-Lite is an ENERGY STAR® partner and most windows are recognized on their “Most Efficient Products” list. Soft-Lite’s vinyl windows are Gold Label Certified by the American Architectural Manufacturers Association (AAMA). Soft-Lite is affiliated with the National Fenestration Rating Council (NFRC) which seeks to develop and measure energy efficiency of windows, doors, and skylights. Soft-Lite windows have been featured on “Extreme Makeover: Home Edition” (ABC) and on Lifetime’s home and garden show “Designing Spaces.” And because they believe in their products, our energy-efficient windows are backed with a lifetime transferrable warranty. Please contact us today to learn about the highly efficient, economical and beautiful replacement window options available through Liberty Home Solutions and Soft-Lite. Your home is your castle, which is why so many people appreciate the sound reducing properties of Soft-Lite windows. Soft-Lite windows are manufactured using several of the same techniques used for soundproofing because sound, just like air, takes the path of least resistance. So the same principles that make a window air-tight helps it reduce sound as well. It’s important to note that tight-fitting frames and well constructed windows will block air and sound, but that’s not all it takes to make a soundproof room. If a wall or other areas in the home are not well made or properly insulated, you might still experience some noise pollution. Number of panes – Double and triple panes will increase the sound-reduction properties of the home..
Laminated glass – Using laminated glass rather than standard glass panes will reduce a windows Sound Transmission Classification (STC). If you are interested in learning more about Soft-Lite sound-proof windows for your home, give us a call. We can help you determine the best replacement window solution for your situation. Windows can be a large problem when it comes to the energy-efficiency of a home. Poorly constructed windows can let air seep through the seals and even the glass itself can add to the problem. The end result is a drafty home that costs more to heat in the winter and more to cool in the summer. Soft-Lite windows are among the most efficient in the industry, with many earning the coveted ENERGY STAR label. These superior windows earn high NFRC (National Fenestration Rating Council) ratings on their U-Factor and Solar Heat Gain rating as well as excellent air infiltration rations through the AAMA (American Architectural Manufacturers Association). 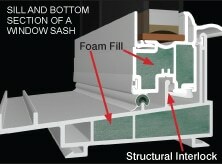 As you can see, Soft-Lite is an industry leader in energy efficient windows. 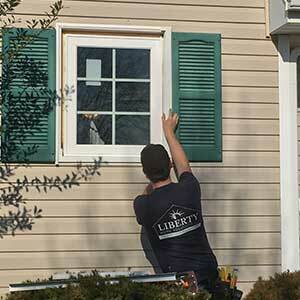 Liberty Home Solutions is the official Soft-Lite window dealer for Springfield and surrounding areas. If you have questions about insulated windows or other quality replacement window options, call or email us. If you’re looking for new windows, you’re going to hear a lot about energy efficiency. These days, everyone is interested in saving on their utility bills and making their home more comfortable in every kind of weather. Unless you’re in the industry, you might be overwhelmed with the terminology, science and range of available options. It pays to be informed, so we want to help you understand and make the best decision for your home. Let’s start with the popular option of double-pane windows. Soft-Lite double hung windows feature two panes of glass, also called “lites.” One lite has a special Low-E coating which reduces heat transfer. Between the lites there is either a PPG Intercept® spacer or structural foam Super Spacer®. Together this offers your home superior insulation from the elements. Double-pane windows from Soft-Lite have a range of energy-efficient tricks up their sleeve, all aimed at giving them the highest energy-efficiency ratings in the business. In fact, they have low U-Factor and SGHC ratings and one of the highest R-Values in the industry, earning them distinctions such as the ENERGY STAR® label. U-Factor- This is a measurement of non-solar heat transfer, such as the heat that escapes through your window during the winter. Lower U-Factors, sometimes call U-Values, mean a more energy efficient window. SHGC – This is a measurement of the heat that enters into a home or building through the glass during warm weather. In North it is best to have a higher SHGC so that the passive light can come in and in the South a lower SHGC is better. R-Value – This is the measure of how well a window insulates the home. Higher R-Values are more insulating and considered better. Liberty Home Solutions provides Soft-Lite windows that offers double-pane window options with U-Factos as low as 0.17, SHGC as low as 0.20 and R-Values as high as 6.66. *And with our highly precise manufacturing process you’re ensured a perfect fit, tight seal and superior protection from the elements. If you’re impressed with our double-pane windows, you’ll be blown away by the energy-efficiency offered by Soft-Lite Triple-pane windows. Like the name suggests, this is a window with three panes of glass, two of which have Low-E coating to reduce heat transfer. 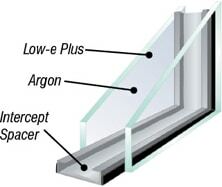 There is either argon or krypton gas between the panes and you can choose either the metal PPG Intercept spacer or structural foam Super Spacer. Triple-pane windows from Soft-Lite provide homeowners the ultimate in flexibility and energy-efficiency. It’s important to take your home’s unique characteristics and climate into account when deciding on replacement windows. As your official Soft-Lite dealer we will help you get the right window and glass options to fit your needs. You’ll enjoy a comfortable, draft-free home for years to come. Contact us today to learn about triple paned windows and other replacement windows for your home.